Growing up with Downs Syndrome and Diabetes meant that Jeremy wasn’t always able to do the same exciting things as his three siblings. So when Jeremy was offered the chance to do his DofE, he jumped at the chance. His three siblings have all achieved their Bronze, Silver and Gold DofE Awards and Jeremy wanted to as well. 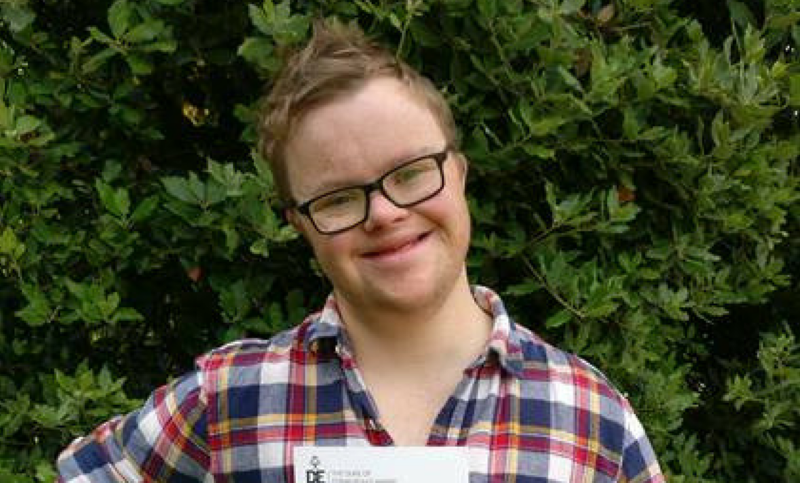 Jeremy originally began his Bronze DofE programme whilst he was in supported living, however he didn’t receive the support he needed to achieve his Award. So when Jeremy moved back to his family home, he was determined to give the DofE another go – signing up to do his Gold DofE programme. He wanted to make new friends, try different things and do some volunteer work so the DofE was perfect to achieve all of these. For Jeremy’s Residential section he travelled to Poland, staying at the International Holiday Camp near Krakow. Being away from home was hard for Jeremy, however he met people from all over Europe and got to wave the UK flag at the opening ceremony, which was a real honour for him. Jeremy and his family were extremely nervous for his Expedition section, since he’d chosen to do a walking expedition in Wales. This was the first time Jeremy had been away without knowing anyone – his routine was thrown, he had to do things he had never done before with complete strangers whilst also maintaining his blood sugars and camping outside. However, he returned with a new group of friends and a belief that he can do anything he puts his mind to. For Jeremy’s Skills section he learned how to cook – a skill he feels has made him more independent, even looking into starting up his own soup making business. Doing his DofE, gave Jeremy a goal to work towards and he was lucky enough to have the complete support of his family throughout. Jeremy is still helping at his local day centre and doing weekly Zumba to keep fit, and has also been inspired by his Volunteering section – looking for volunteer work so that he can help as many people as possible in particular the homeless. “I’ve just started working at Wiltshire Police HQ helping with admin. My Gold DofE Award helped me get that job. I talked about my DofE experience during my interview. Doing my DofE was great – I’ve made lots of new friends from all over the world and got fitter and I am so proud that I have achieved the same thing as my sister and brothers”.